A new method of producing ultrathin metal-oxide sheets with intricate crumple and wrinkle pattern has been developed by researchers at the Brown University. The researchers show the efficient performance of these textured metal-oxide films when used as battery electrodes and photocatalysts, in a paper published in ACS Nano. The new discovery is based on the work conducted earlier by the same research team. In this earlier project, the team introduced fine crumple and wrinkle textures on sheets of the nanomaterial – graphene oxide. The research demonstrated that the properties of the material were enhanced by the process. The texture improved the capability of graphene to conduct electricity, and the material’s water-repelling ability, making it more useful in developing water-resistant coatings. The team believed that the properties of other materials can be enhanced with similar structures; but there was one problem. The researchers compressed the sheets several times in multiple orientations to introduce crumple and wrinkle structures in graphene. This process cannot be used for metal oxides, as it would not work. Metal oxides are too stiff. If you try to compress them, they crack. We showed that we can transfer those surface features from the graphene onto the metal oxides. Therefore Chen, who was collaborating with the labs of Robert Hurt and Ian Y. Wong, both engineering professors from Brown, created a technique of making crumpled metal-oxide films by utilizing crumpled graphene sheets as templates. The researchers began by producing stacks of textured graphene sheets by employing the same method they had developed earlier. They placed the graphene on a polymer substrate, which shrinks when heat is applied. The graphene on top compresses as the substrate shrinks, which results in the creation of crumple or wrinkle structures. The researchers then removed the substrates, obtaining free-standing sheets of crumpled graphene. This compression process can be performed multiple times, making more intricate structures. In this process the types of textures formed can also be controlled. When shrink films are clamped on opposite sides and allowed to shrink in only one direction, periodic wrinkles can be formed. Crumples can be created by shrinking in all directions. Shrinks can be done in multiple configurations, multiple times to make a broad variety of textures. 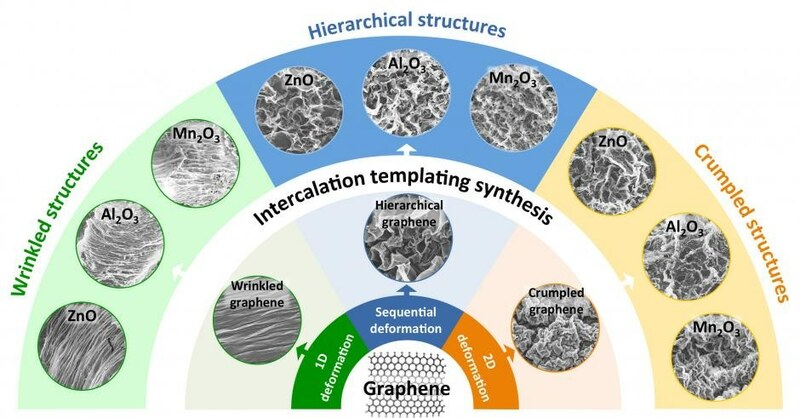 Chen deposited the stacks of textured graphene sheets in a water-based solution that contained positively charged metal ions, to transfer the structures onto metal oxides. These ions were pulled into the space between the sheets by the negatively charged graphene. The particles bonded in the space between the layers, resulting in the creation of metal sheets that contained the wrinkle structures of the graphene. Oxidation was then used to remove the graphene, leaving behind the wrinkled metal-oxide sheets. Chen shows that the method works with a wide range of metal oxides including aluminum, copper, zinc, and manganese oxides. After creating the textured metal-oxides, the researchers tested them to see if the materials’ properties were enhanced by the textured surfaces, as they were in graphene. The tests show that the charge carrying capacity of wrinkled manganese oxide, when used as a battery electrode, was four times higher than that of a planar sheet. The team believes that this may be because the wrinkle ridges act as a defined path that the electrons can follow, allowing the material to carry more electrons at a time. The ability of crumpled zinc oxide to perform a photocatalytic reaction – reducing a dye that is dissolved in water under UV light – was also tested by the researchers. The results showed that when compared to a planar film, a crumpled zinc oxide film was four times more reactive. Chen explained that this was due to the higher surface area of crumpled films, which provide the material with more reactive sites. The process not only enhances the properties of metals but also provides a means of developing thin films from materials that cannot generally be adapted for ultrathin configurations. Using graphene confinement, we can guide the assembly and synthesis of materials in two dimensions,” he said. “Based on what we learned from making the metal-oxide films, we can start to think about using this method to make new 2D materials that are otherwise unstable in bulk solution. But with our confinement method, we think it’s possible. Muchun Liu, Thomas Valentin, Zhongying Wang, Ruben Spitz Steinberg, and Jaskiranjeet Sodhi were the other researchers who authored the paper with Chen, Hurt, and Wong. Hibbitt Engineering Postdoctoral Fellowship supported the research and seed funding was provided by Brown University.